NEW! If you have an in-district trainer, you can now buy manuals without training dates. No trainer? Check out our 4th edition manual without the workshop. Minimum order of 5. Want more? Contact us! Use this order form! Learn about CRISS! Listen to a 9-minute overview or contact us to schedule a live, online Q & A. We are discontinuing our CRISS for Students curricula. Need something? Let us know via email. Amazing deals available to clear our warehouse! Trainers, email us with your workshop scheduling details for our calendar and to receive login information for your participants. Empower learners to be engaged, metacognitive, and strategic. Empower parents to support student learning at all grade levels. Empower teachers with practical tools to facilitate high level thinking. Empower coaches and other teacher leaders to support reflective teaching and learning. Empower administrators to be effective instructional leaders. 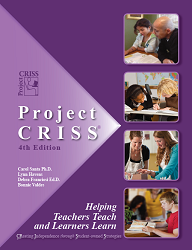 With over 30 years of experience connecting research to instruction, Project CRISS provides high quality, practical professional development and support materials for K-16 teaching and learning. CRISS implementation supports rigorous 21st Century Standards and complements the Danielson Framework, growth mindset, project-based learning, deeper learning, and other education initiatives while validating the dedication, knowledge, and experience of educators. We offer regional, on-site, and online PD! Graduate credit is available.